John Wood ’89 revels in the statistics. By year’s end, a full five years ahead of schedule, Wood’s Room to Read nonprofit will have benefited 10 million children across 17,000 communities in Asia and Africa by focusing on literacy and gender equality in education. It was while vacationing in Nepal in 1999 and seeing unremitting poverty that Wood’s life took on its dramatic new locus. Literacy, he says, is the baseline on which to build an education and create economic prosperity. 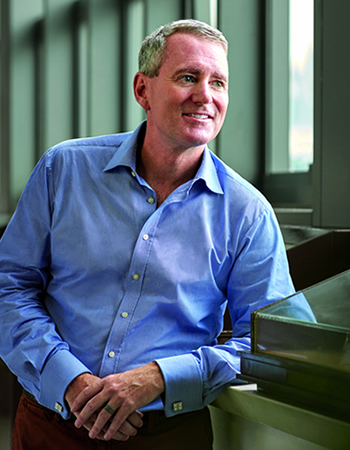 “Two out of seven people live on $2 a day or less,” says Wood, who wrote about his road to social entrepreneurship in a pair of books: Leaving Microsoft to Change the World and Creating Room to Read: A Story of Hope in the Battle for Global Literacy. After founding Room to Read in 2000, Wood, who is based in Hong Kong, set out to persuade benefactors — mainly business executives and companies — to donate $325 million in capital to Room to Read by demonstrating that it’s an efficiently run model for social change. "Learning to read can be a lucky break for millions of children, and eventually millions of families"
The nonprofit is fastidiously data-driven. Research tracks everything from average words read per minute and library access time to graduation rates and community co-investment in school construction projects. Data further show the challenge at hand: around the world, 773 million people cannot read or write.